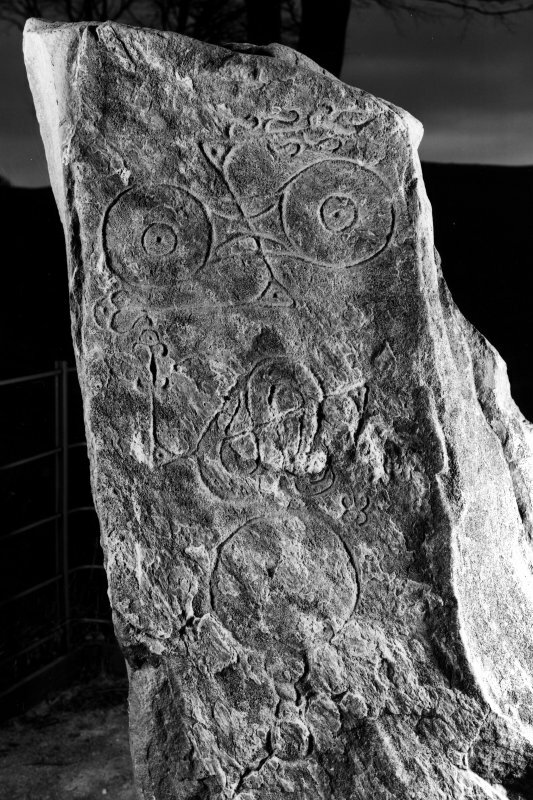 View of face of Picardy Pictish symbol stone, Myreton Farm. Myreton Farm, Picardy Stone. Detail of upper part of stone showing carvings, dated 16 April 1996. 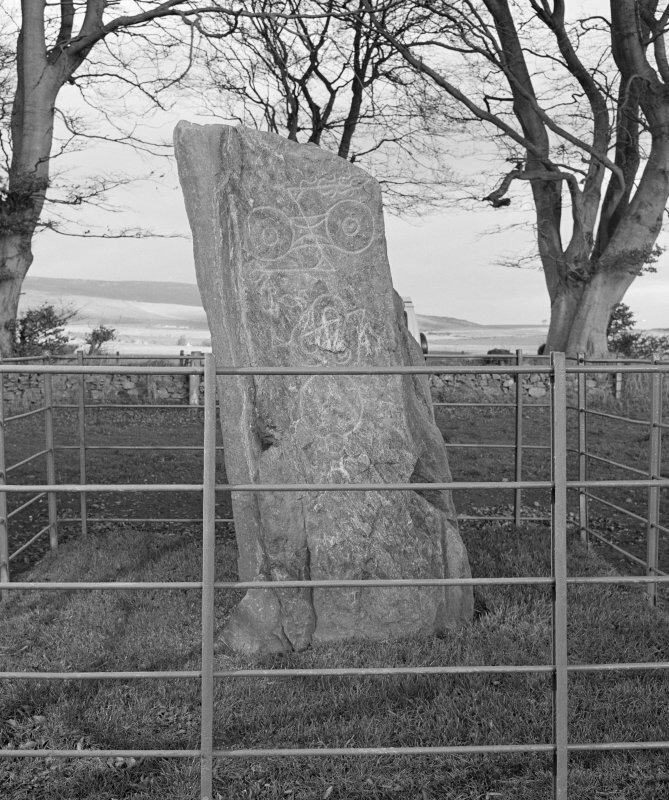 View of the Picardy Stone, Pictish symbol stone, Myreton Farm, Aberdeenshire. 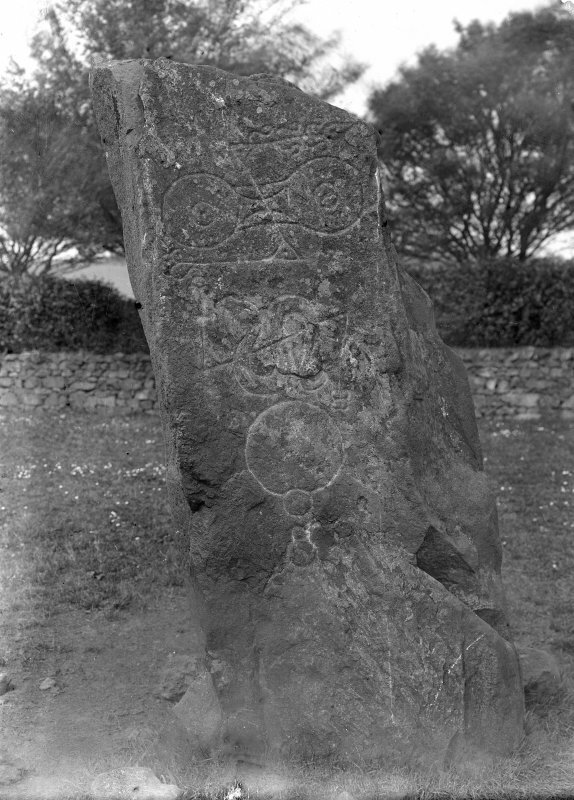 Original half-plate glass negative captioned: 'Sculptured Stone at Myreton near INSCH'. 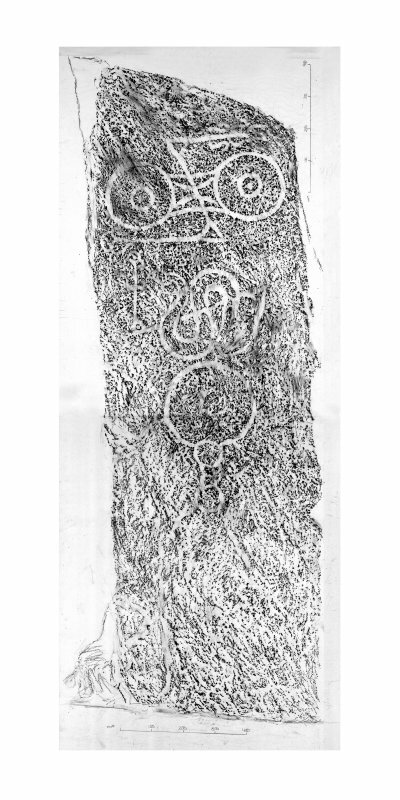 Photographic copy of rubbing showing detail of the face of the Picardy Stone Pictish symbol stone, Myreton Farm, Insch, Aberdeenshire. 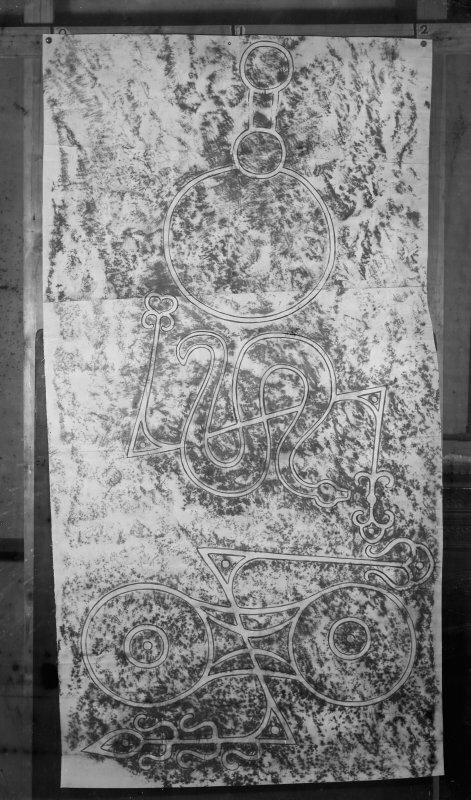 Myreton Farm, composite digital image of rubbing of Picardy stone. Picardy Stone. Mireton Farm, Insch. View of Picardy Stone, Myreton Farm.This stone shows well marked glacial striae. 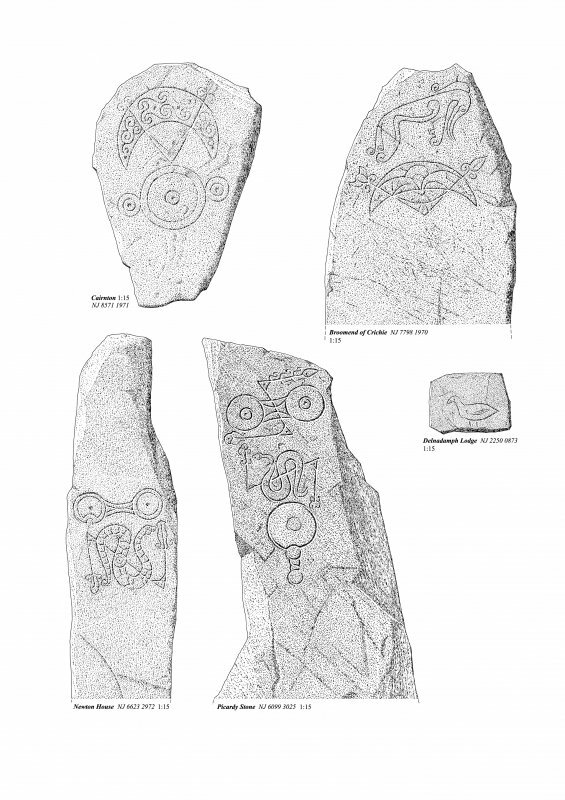 Digital image of the 'Picardy Stone' from J Stuart, The Sculptured Stones of Scotland, i, pl.6. Present location: still in situ in field. Evidence for discovery: recorded around 1850, standing on cairn 2.00m in diameter covering empty grave. 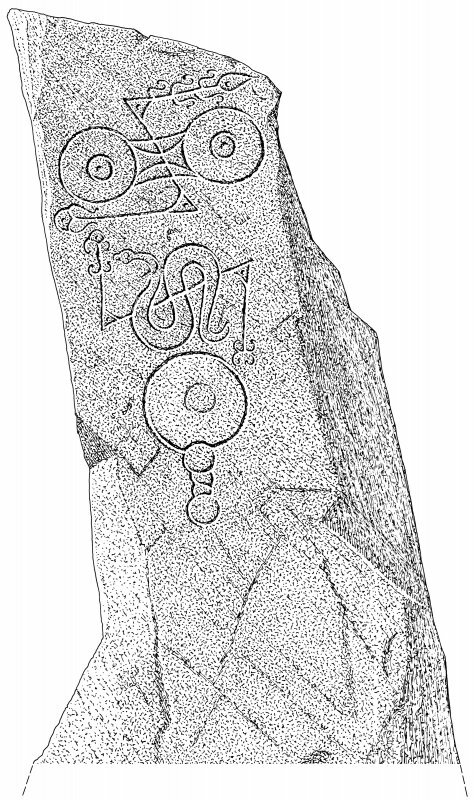 An angular tapering stone, one broad face is incised with three symbols: double disc and Z-rod, serpent and Z-rod and mirror. References: Stuart 1856, 4; Fraser 2008, no 42. 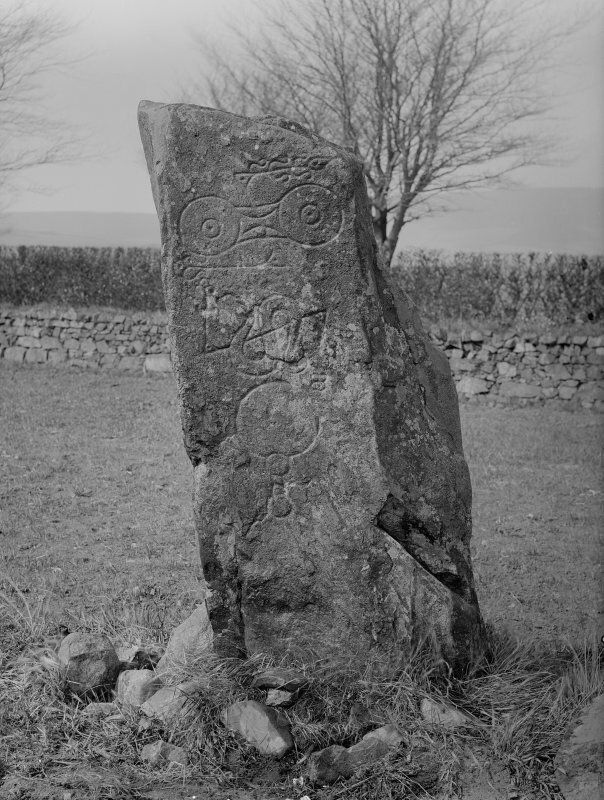 A Class 1 Pictish symbol stone, known locally as the Picardy stone, is an erect pillar 6' 6" high (Allen and Anderson 1903) now under guardianship of the MoW. When the area around the stone was examined in 1856, it was found to stand on a cairn, 6ft in diameter and extending 3ft below ground surface. Some 3ft to the S of the stone, and 5ft below ground level, was an empty grave, oriented E-W, and 7ft in length. Among the stones at the top was 'the usual black mould', and some of the stones were marked by fire (Stuart 1856). J Stuart 1856; Name Book 1866; J R Allen and J Anderson 1903. This Class I stone stands in a little enclosure close to a by-road between Netherton and Myreton farmhouses. It is incised with a couble disc and Z-rod, a serpent and Z-rod, and a mirror symbol. The Picardy Stone: as described and illustrated. The stone is of a hard, black whinstone with quartz veins, measuring 2m (high) x 0.45m (thick). Base width - 0.9m, tapers to top width - 0.66m. 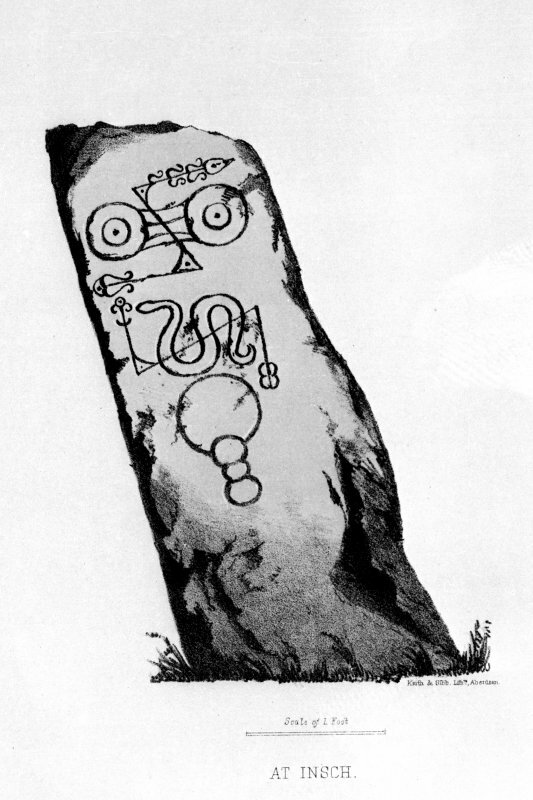 Stone inscribed with double disc and z-rod above a serpent and z-rod symbol. Beneath, a mirror. Visited by R Jones 1985 (Research). 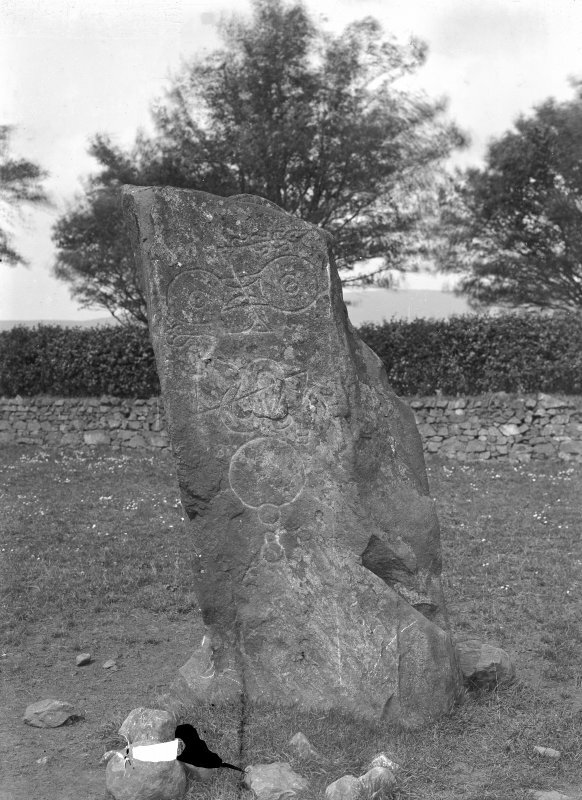 This rough whinstone pillar, standing 1.98m high, bears three finely-incised symbols and is unusual in being, apparently, still in its original location. The symbols are on the S face and coomprise a well-drawn double-disc and Z-rod (the latter with ornate flame-like terminal) over a tightly-coiled serpent and a Z-rod with a simple mirror beneath; there is no comb. In 1856 'excavation' revealed that the stone stood on a low cairn (1.9m in diameter) which had an extended grave beneath its perimeter. I A G Shepherd 1986. 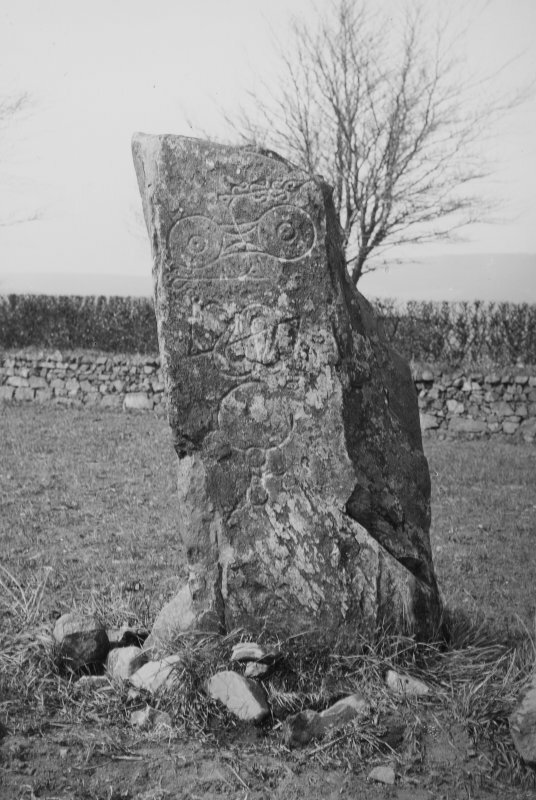 This rough whinstone pillar, standing 1.98m high, bears three finely incised symbols and is unusual in being, apparently, still in its original location. The symbols are on the south face and consist of a well drawn double disc and Z-rod, the latter with ornate, flame-like, terminal over a tightly coiled serpent and Zrod with a simple mirror beneath. (There is no comb.) The essentially prehistoric, remote quality of the Pictish symbols can be gauged here. An 'excavation' in 1856 found that the stone stood on a low cairn, 1.9m in diameter, which had an extended grave beneath its perimeter; this emphasises the association between symbol stones and burial and property rights. This rough whinstone pillar, standing 1.98m high, bears three finely incised symbols and is unusual in being, apparently, still in its original location. The symbols are on the south face and consist of a well drawn double disc and Z-rod, the latter with ornate, flame-like, terminal over a tightly coiled serpent and Z-rod with a simple mirror beneath. (There is no comb.) The essentially prehistoric,remote quality of the Pictish symbols can be gauged here. 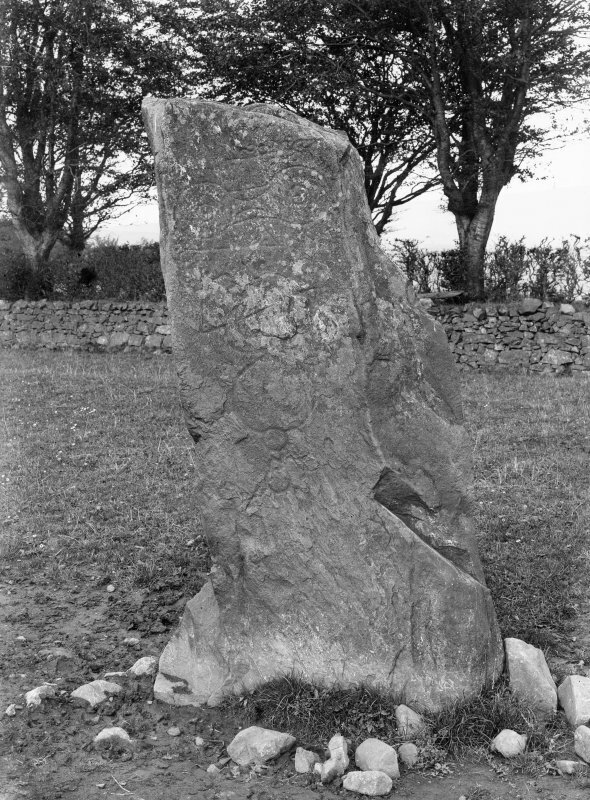 An 'excavation' in 1856 found that the stone stood on a low cairn, 1.9m in diameter, which had an extended grave beneath its perimeter; this emphasises the association between symbol stones and burial and property rights. The clear view of Dunnideer hillfort (no. 75) may also be significant. Class I symbol stone showing on the S.face a serpent and Z-rod with a double-disc and Z-rod above and a mirror below. There is no addition to the existing record. Visited by RCAHMS (JRS, RL), 10 June 2003. As part of The Rise and Fall of the Picts: Survey and Excavation at the Early Power Centres and Symbol Stones of Northern Pictland Project a magnetometry survey was carried out, 29–30 September 2012, around the Picardy Stone, a Class I symbol stone, at Myreton Farm. An excavation in 1856 of the area around the stone had recorded a cairn, c2m in diameter, surrounding the stone and a possible E–W oriented grave, just to the S of the stone. The survey recorded a number of anomalies including a small number of rectilinear or sub-rectilinear anomalies. The size of these anomalies ranged from 10–25m long and c8–12m wide. 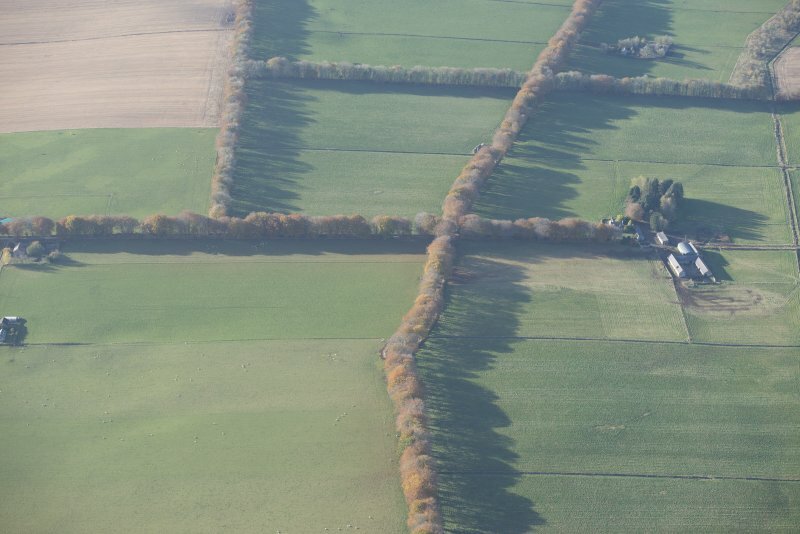 A number of linear anomalies, possibly old field boundaries and cultivation remains were also identified. Further clarification of the survey results would require trial excavation or more refined survey methodologies.